Writer/Curator Stephen J. Williams, Ph.D. According to the report one patient with breast cancer that had metastasized to liver, lungs, bone, and ovaries developed severe hepatotoxicity as evidenced by elevated serum transaminase activities (AST and ALT) and hyper-billirubinemia. Serum liver enzyme activities did not attenuate upon discontinuation of CUDC-427. This was unlike prior experience to the CUDC-427 drug, in which decreased hepatic function was reversed upon drug discontinuation. The patient died from liver failure one month after discontinuation of CUDC-427. It was noted that no other patient had experienced such a serious, irreversible liver dysfunction. 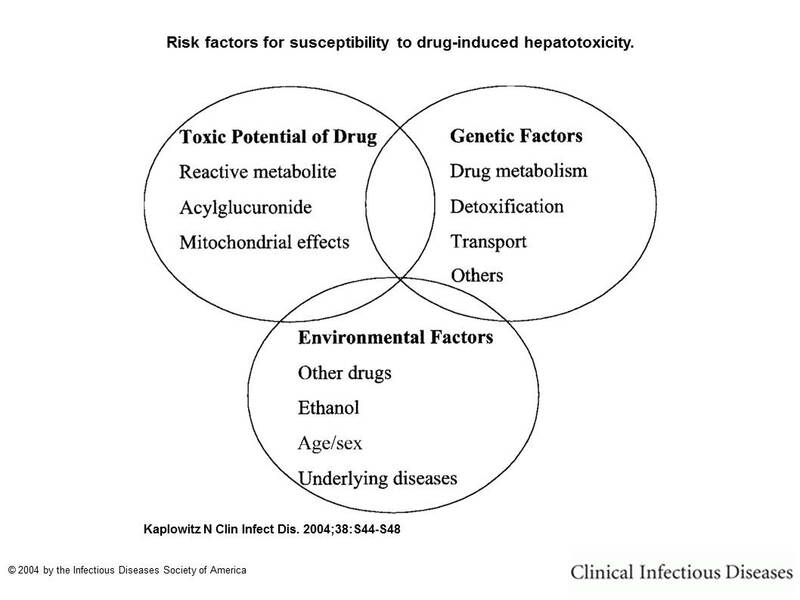 Although any incidence of hepatotoxicity can be cause for concern, the incidence of IDIOSYNCRATIC IRREVERSIBLE HEPATOTOXICITY warrants a higher scrutiny. Since there is not enough information to investigate toxicogenomic or toxicokinetic mechanisms for this compound, the rest of this post will investigate the possible mechanisms of hepatotoxicity due to IAP antagonists and clues from other clinical trials which might shed light on a mechanism of toxicity (toxicodynamic) or idiosyncratic events. Given inflammation, genetic risk factors, and cellular stresses (seen in clinical setting) have been implicated in idiosyncratic drug-induced liver injury from targeted therapies, should preclinical hepatotoxicity studies also be conducted in the presence of the metastatic disease? Does inflammation and cellular stress from clinical disease unmask NONCANONICAL pharmacologic and/or toxicological mechanisms of action? A. Cytotoxic (Necrotic): irreversible cell death characterized by loss of cell membrane integrity, intracellular swelling, nuclear shrinkage (pyknosis) and eventual cytoplasmic breakdown of nuclear DNA (either by a process known as karyolysis or karyorhexus) localized inflammation as a result of release of cellular constituents. Intracellular ATP levels are commonly seen in necrotic death. Necrosis, unlike apoptosis, does not require a source of ATP. A nice review by Yoshihide Tsujimoto describing and showing (by microscopy) the differences between apoptosis and necrosis can be found here. B. Cholestatic: hepatobiliary dysfunction with bile stasis and accumulation of bile salts. Cholestatic injury can result in lipid (particularly cholesterol) accumulation in cannicular membranes resulting in decreased permeability of the membrane, hyperbillirubinemia and is generally thought to result in metabolic defects. A. Chirrotic: Chronic morphologic alteration of the liver characterized by the presence of septae of collagen distributed throughout the major portion of the liver; Forms fibrous sheaths altering hepatic blood flow, resulting in a necrotic process with scar tissue; Alteration of hepatic metabolic systems. correlates well with incidence of human IDILI (adapted from a review Inflammatory Stress and Idiosyncratic Hepatotoxicity: Hints from Animal Models (in Pharmacology Reviews). Idiosyncratic injury damage has been reported for diclofenac, halothane, and sulinac. These drugs also show hepatotoxicity in the LPS model for IDILI. Figure. Idiosyncratic toxic responses of the liver. In the absence of stress and/or genetic factors, drug exposure may result in an idiosyncratic liver injury (IDILI) at a point (or dose) beyond the therapeutic range and lethal exposure for that drug. Preclinical studies, usually conducted at sublethal doses, would not detect DILI . 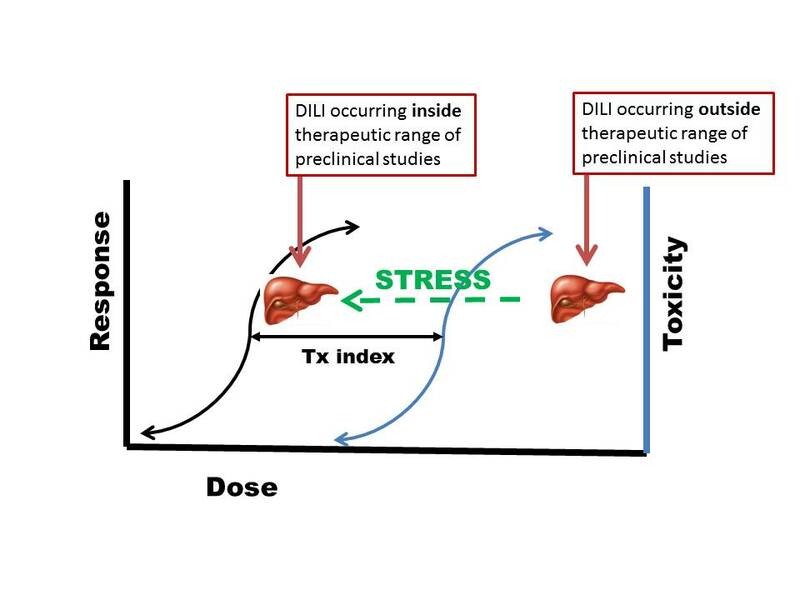 Stress and/or genetic factors sensitize the liver to toxic effects of the drug (synergism) and DILI is detected at exposure levels closer to therapeutic range. Note IDILI is not necessarily dose-dependent but cellular stress (like ROS or inflammation) may expose NONCANONICAL mechanisms of drug action or toxicity which result in IDILI. Model adapted from Roth and Ganey. What Stress factors contribute to IDILI? Various stresses including inflammation from bacterial, viral infections ,inflammatory cytokines and stress from reactive oxygen (ROS) have been suggested as mechanisms for IDILI. Inflammation/Cytokines (also discussed in other sections of this post): Inflammation has long been associated with human cases of DILI. Many cytokines and inflammatory mediators have been implicated including TNFα, IL7, TGFβ, and IFNϒ (viral infection) leading some to conclude that serum measurement of cytokines could be a potential biomarker for DILI. In addition, ROS (see below) is generated from inflammation and also considered a risk factor for DILI. Reactive Oxygen (ROS)/Reactive Metabolites: Oxidative stress, either generated from reactive drug metabolites or from mitochondrial sources, has been shown to be involved in apoptotic and necrotic cell death. Both alterations in the enzymes involved in the generation of and protection from ROS have been implicated in increased risk to DILI including (as discussed further) alterations in mitochondrial superoxide dismutase 2 (SOD2) and glutathione S-transferases. Both ROS and inflammatory cytokines can promote JNK signaling, which has been implicated in DILI. “develop a unifying hypothesis that involves underlying genetic or acquired mitochondrial abnormalities as a major determinant of susceptibility for a number of drugs that target mitochondria and cause DILI. The mitochondrial hypothesis, implying gradually accumulating and initially silent mitochondrial injury in heteroplasmic cells which reaches a critical threshold and abruptly triggers liver injury, is consistent with the findings that typically idiosyncratic DILI is delayed (by weeks or months), that increasing age and female gender are risk factors and that these drugs are targeted to the liver and clearly exhibit a mitochondrial hazard in vitro and in vivo. New animal models (e.g., the Sod2(+/-) mouse) provide supporting evidence for this concept. However, genetic analyses of DILI patient samples are needed to ultimately provide the proof-of-concept”. To this end, Dr. Brett Howell and other colleagues at the Hamner-UNC Institute for Drug Safety Sciences (IDSS) developed an in-silico model of DILI ( the DILISym™ model)which is based on depletion of cellular ATP and reactive metabolite formation as indices of DILI. Have there been Genetic Risk Factors identified for DILI? Glutathione S-transferase (GSTT1): patients with a double GSTT1-GSTM1 null genotype had a significant 2.7 fold increased risk of DILI from nonsteroidal anti-inlammatory agents, troglitazone and tacrine. GSTs are involved in the detoxification of phase 1 metabolites and also protect against cellular ROS. A priori GWAS have the advantage of being hypothesis-free, and although they may produce a high number of false-positives, new studies of genetic risk factors of ximelagatran, flucioxaciliin and diclofenac-induced liver injury are using a hybrid approach which combines the whole genome and unbiased benefits of GWAS with the confirmatory and rational design of CGAS[8-10]. Identification of risk factors for rare idiosyncratic hepatotoxicity requires special networks that contribute to data collection and subsequent identification of environmental as well as genetic risk factors for clinical cases of idiosyncratic DILI. Therefore, a DILI network project (DILIN) had been developed to collect samples and detailed genetic and clinical data on IDILI cases from multiple medical centers. The project aims to identify the upstream and downstream genetic risk factors for IDILI. Please see a SlideShare presentation here of the goals of the DILI network project. Drs Colin Spraggs and Christine Hunt had reviewed possible genetic risk factors of DILI seen with various tyrosine kinase inhibitors (TKIs) including Lapatinib (Tykerb/Tyverb©, a dual inhibitor of HER2/EGFR heterodimer) and paopanib (Votrient©; a TKI that targets VEGFR1,2,3 and PDGFRs). Note that these clinical findings were not evident from the preclinical tox studies. According to the European Medicines Agency assessment report for Tykerb states: “the major findings in repeat dose toxicity studies were attributed to lapatinib pharmacology (epithelial effect in skin and GI system. The toxic events occurred at exposures close to the human exposure at the recommended dose. Repeat-dose toxicity studies did not reveal important safety concerns than what would be expected from the mode of action”. However, it should be noted that in high dose repeat studies in mice and rats, severe lethality was seen with hematologic, gastrointestinal toxicities in combination with altered blood chemistry parameters and yellowing of internal organs. Norvatis IAP Inhibitor LCL161: at 2012 San Antonia Breast Cancer Symposium, a phase 1 trial in triple negative breast cancer showed promising results when given in combination with paclitaxel. Ascenta Therapeutics IAP inhibitor AT-406 in phase 1 in collaboration with Debiopharm S.A. showed antitumor efficacy in xenograft models of breast, pancreatic, prostate and lung cancer. The development of this compound is described in a paper by Cai et. al. Phase II Study of Birinapant for Advanced Ovarian, Fallopian Tube, and Peritoneal Cancer (NCI-12-C-0191). Principle Investigator: Dr. Christina Annunziata. See the protocol summary. More open trials for this drug are located here. Closed trials including safety studies can be found here. A Phase 1 non-randomized dose escalation study to determine maximum tolerated dose (MTD) and characterize the safety for the TetraLogic compound TL32711 had just been completed. Results have not been published yet. In general, IAP proteins are directly involved in inhibiting apoptosis by binding and directly inhibiting the effector cysteine protease caspases (caspase 3/7) ultimately responsible for the apoptotic process . IAPs were actually first identified in baculoviral genomes because of their ability to suppress host-cell death responses during viral infection . IAP proteins are often overexpressed in cancers . 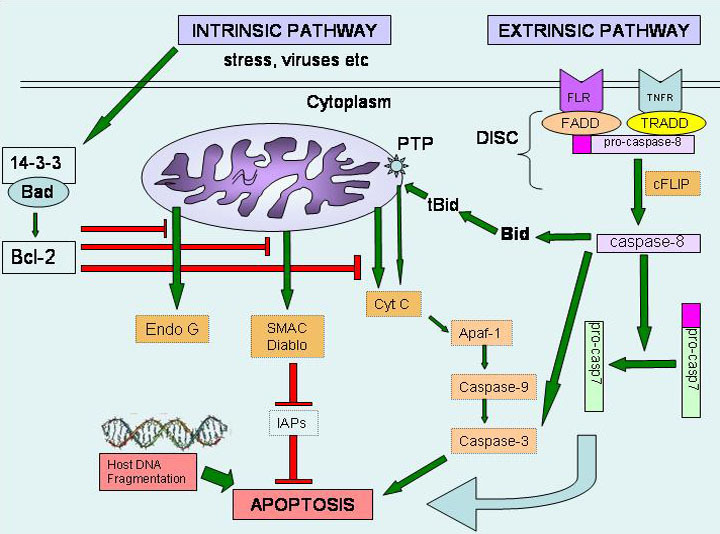 Intrinsic pathway: initiated by DNA damage, irradiation, chemotherapeutics; mitochondrial pathway involving caspase 9 and cytochrome c release from mitochondria; mitochondria also releases SMAC/DIABLO, which binds and inhibits XIAP (XIAP inhibits the Intrinsic apoptotic pathway. IAP1/2 is a negative regulator of the noncanonical NF-ΚB signaling pathway by promoting proteosomal degradation of the TRAF signaling complex. A wonderfully annotated list of NF-ΚB target genes can be found on the Thomas Gilmore lab site at Boston University at http://www.bu.edu/nf-kb/gene-resources/target-genes/ . NF-ΚB has been considered a possible target for chemotherapeutic development however Drs. Veronique Baud and Michael Karin have pondered the utility of IAP antagonists as a good target in their review: Is NF-ΚB a good target for cancer therapy? : Hopes and pitfalls . The authors discuss issues such that IAP antagonism induced both the classical and noncanonical NF-ΚB pathway thru NIK stabilization, resulting in stabilization of NF-ΚB signaling and thereby undoing any chemotherapeutic effect which would be desired. IAPs have been shown to interact with other proteins including a report that SIAP regulates AKT activity and caspase-3-dependent cleavage during cisplatin-induced apoptosis in human ovarian cancer cells and could be another mechanism involved in cisplatin resistance. In addition there have been reports that IAPs can regulate JNK and MAPK signaling. Therefore, IAPs are involved in CANONICAL and NONCANONICAL pathways. In addition Rume Damgaard and Mads Gynd-Hansen have suggested that IAP antagonists may be useful in treating inflammatory diseases like Crohn’s disease as IAPs regulate innate and acquired immune responses. In a related note, a similar type of fatal idiosyncratic hepatotoxicity was reported in a 62 year-old man treated with the Raf kinase inhibitor sorafenib for renal cell carcinoma: Fatal case of sorafenib-associated idiosyncratic hepatotoxicity in the adjuvant treatment of a patient with renal cell carcinoma; Case Report in BMC Cancer. These findings are in line with a drug-induced inflammation and IDILI. In addition to hepatotoxicity, renal insufficiency developed in this patient. The authors had suggested the death was probably due to “an idiosyncratic allergic reaction to sorafenib manifesting as hepatotoxicity with associated renal impairment”. The authors also noted that genome wide association studies of idiosyncratic drug-induced liver injury support involvement of major histocompatibility complex (MHC) polymorphisms. MHC involvement has also been associated with lapatanib and pazopanib hepatotoxicity [27, 28]. Curis has been involved in another novel oncology therapeutic, a first in class. Last year Roche and Genentech had won approval for a Hedgehog pathway inhibitor vismodegib for treatment of advanced basal cell carcinoma (reported at FierceBiotech©). Vismodegib was initially developed in collaboration with Curis, Inc. The hedgehog signaling pathway, which controls the function of Gli factors (involved in stem cell differentiation), is overactive in advanced basal cell carcinoma as well as other cancer types. As an additional reference, the FDA National Center for Toxicological Research has developed THE LIVER TOXICITY KNOWLEDGE BASE (LTKB). 1. Roth RA, Ganey PE: Intrinsic versus idiosyncratic drug-induced hepatotoxicity–two villains or one? The Journal of pharmacology and experimental therapeutics 2010, 332(3):692-697. 2. Waring JF, Liguori MJ, Luyendyk JP, Maddox JF, Ganey PE, Stachlewitz RF, North C, Blomme EA, Roth RA: Microarray analysis of lipopolysaccharide potentiation of trovafloxacin-induced liver injury in rats suggests a role for proinflammatory chemokines and neutrophils. The Journal of pharmacology and experimental therapeutics 2006, 316(3):1080-1087. 3. Deng X, Luyendyk JP, Ganey PE, Roth RA: Inflammatory stress and idiosyncratic hepatotoxicity: hints from animal models. Pharmacological reviews 2009, 61(3):262-282. 4. Laverty HG, Antoine DJ, Benson C, Chaponda M, Williams D, Kevin Park B: The potential of cytokines as safety biomarkers for drug-induced liver injury. European journal of clinical pharmacology 2010, 66(10):961-976. 5. Schwabe RF, Brenner DA: Mechanisms of Liver Injury. I. TNF-alpha-induced liver injury: role of IKK, JNK, and ROS pathways. American journal of physiology Gastrointestinal and liver physiology 2006, 290(4):G583-589. 6. Seki E, Brenner DA, Karin M: A liver full of JNK: signaling in regulation of cell function and disease pathogenesis, and clinical approaches. Gastroenterology 2012, 143(2):307-320. 7. Kaplowitz N: Drug-induced liver injury. Clinical infectious diseases : an official publication of the Infectious Diseases Society of America 2004, 38 Suppl 2:S44-48. 8. Kindmark A, Jawaid A, Harbron CG, Barratt BJ, Bengtsson OF, Andersson TB, Carlsson S, Cederbrant KE, Gibson NJ, Armstrong M et al: Genome-wide pharmacogenetic investigation of a hepatic adverse event without clinical signs of immunopathology suggests an underlying immune pathogenesis. The pharmacogenomics journal 2008, 8(3):186-195. 9. Aithal GP, Ramsay L, Daly AK, Sonchit N, Leathart JB, Alexander G, Kenna JG, Caldwell J, Day CP: Hepatic adducts, circulating antibodies, and cytokine polymorphisms in patients with diclofenac hepatotoxicity. Hepatology 2004, 39(5):1430-1440. 10. Daly AK, Aithal GP, Leathart JB, Swainsbury RA, Dang TS, Day CP: Genetic susceptibility to diclofenac-induced hepatotoxicity: contribution of UGT2B7, CYP2C8, and ABCC2 genotypes. Gastroenterology 2007, 132(1):272-281. 11. Russmann S, Kullak-Ublick GA, Grattagliano I: Current concepts of mechanisms in drug-induced hepatotoxicity. Current medicinal chemistry 2009, 16(23):3041-3053. 12. Fontana RJ, Watkins PB, Bonkovsky HL, Chalasani N, Davern T, Serrano J, Rochon J: Drug-Induced Liver Injury Network (DILIN) prospective study: rationale, design and conduct. Drug safety : an international journal of medical toxicology and drug experience 2009, 32(1):55-68. 13. Spraggs CF, Xu CF, Hunt CM: Genetic characterization to improve interpretation and clinical management of hepatotoxicity caused by tyrosine kinase inhibitors. Pharmacogenomics 2013, 14(5):541-554. 14. de Almagro MC, Vucic D: The inhibitor of apoptosis (IAP) proteins are critical regulators of signaling pathways and targets for anti-cancer therapy. Experimental oncology 2012, 34(3):200-211. 15. Deveraux QL, Takahashi R, Salvesen GS, Reed JC: X-linked IAP is a direct inhibitor of cell-death proteases. Nature 1997, 388(6639):300-304. 16. Crook NE, Clem RJ, Miller LK: An apoptosis-inhibiting baculovirus gene with a zinc finger-like motif. Journal of virology 1993, 67(4):2168-2174. 17. Tamm I, Kornblau SM, Segall H, Krajewski S, Welsh K, Kitada S, Scudiero DA, Tudor G, Qui YH, Monks A et al: Expression and prognostic significance of IAP-family genes in human cancers and myeloid leukemias. Clinical cancer research : an official journal of the American Association for Cancer Research 2000, 6(5):1796-1803. 18. Laukens B, Jennewein C, Schenk B, Vanlangenakker N, Schier A, Cristofanon S, Zobel K, Deshayes K, Vucic D, Jeremias I et al: Smac mimetic bypasses apoptosis resistance in FADD- or caspase-8-deficient cells by priming for tumor necrosis factor alpha-induced necroptosis. Neoplasia 2011, 13(10):971-979. 19. He S, Wang L, Miao L, Wang T, Du F, Zhao L, Wang X: Receptor interacting protein kinase-3 determines cellular necrotic response to TNF-alpha. Cell 2009, 137(6):1100-1111. 20. Baud V, Karin M: Is NF-kappaB a good target for cancer therapy? Hopes and pitfalls. Nature reviews Drug discovery 2009, 8(1):33-40. 21. Asselin E, Mills GB, Tsang BK: XIAP regulates Akt activity and caspase-3-dependent cleavage during cisplatin-induced apoptosis in human ovarian epithelial cancer cells. Cancer research 2001, 61(5):1862-1868. 22. Kearney CJ, Sheridan C, Cullen SP, Tynan GA, Logue SE, Afonina IS, Vucic D, Lavelle EC, Martin SJ: Inhibitor of apoptosis proteins (IAPs) and their antagonists regulate spontaneous and tumor necrosis factor (TNF)-induced proinflammatory cytokine and chemokine production. The Journal of biological chemistry 2013, 288(7):4878-4890. 23. Damgaard RB, Gyrd-Hansen M: Inhibitor of apoptosis (IAP) proteins in regulation of inflammation and innate immunity. Discovery medicine 2011, 11(58):221-231. 24. Erickson RI, Tarrant J, Cain G, Lewin-Koh SC, Dybdal N, Wong H, Blackwood E, West K, Steigerwalt R, Mamounas M et al: Toxicity profile of small-molecule IAP antagonist GDC-0152 is linked to TNF-alpha pharmacology. Toxicological sciences : an official journal of the Society of Toxicology 2013, 131(1):247-258. 25. Fairfax BP, Pratap S, Roberts IS, Collier J, Kaplan R, Meade AM, Ritchie AW, Eisen T, Macaulay VM, Protheroe A: Fatal case of sorafenib-associated idiosyncratic hepatotoxicity in the adjuvant treatment of a patient with renal cell carcinoma. BMC cancer 2012, 12:590. 26. 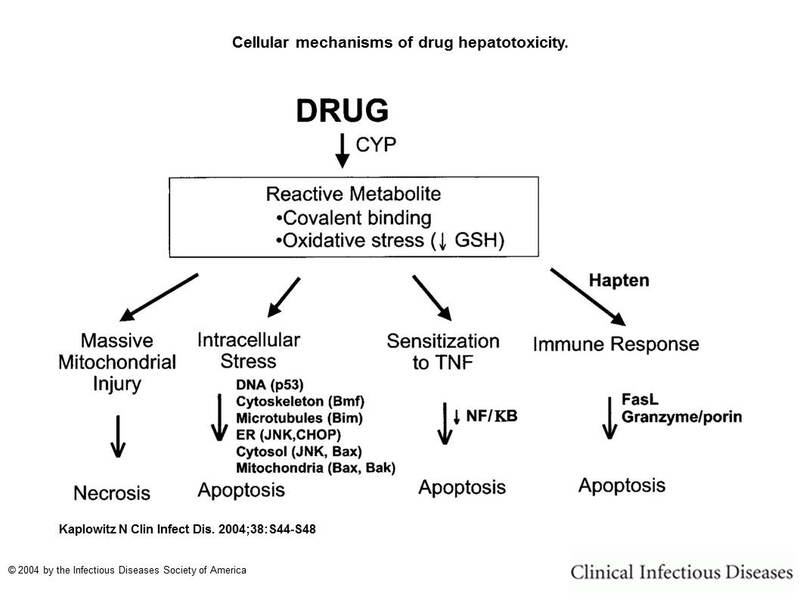 Daly AK: Drug-induced liver injury: past, present and future. Pharmacogenomics 2010, 11(5):607-611. 27. Spraggs CF, Budde LR, Briley LP, Bing N, Cox CJ, King KS, Whittaker JC, Mooser VE, Preston AJ, Stein SH et al: HLA-DQA1*02:01 is a major risk factor for lapatinib-induced hepatotoxicity in women with advanced breast cancer. Journal of clinical oncology : official journal of the American Society of Clinical Oncology 2011, 29(6):667-673. 28. Xu CF, Reck BH, Goodman VL, Xue Z, Huang L, Barnes MR, Koshy B, Spraggs CF, Mooser VE, Cardon LR et al: Association of the hemochromatosis gene with pazopanib-induced transaminase elevation in renal cell carcinoma. Journal of hepatology 2011, 54(6):1237-1243.